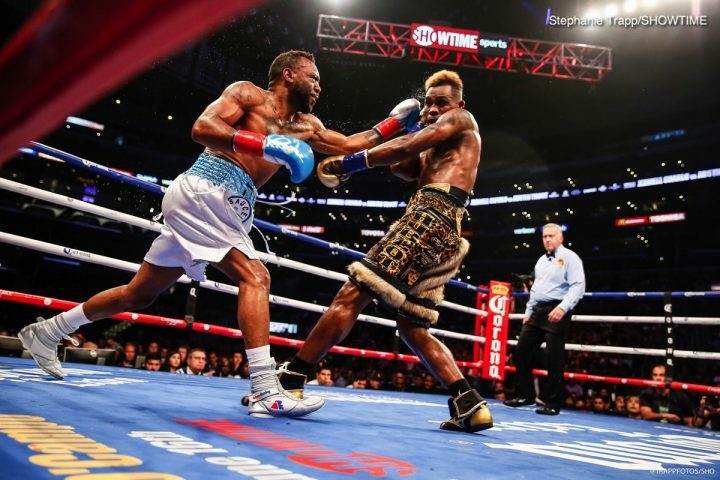 By Dan Ambrose: WBC junior middleweight champion Jermell Charlo beat Austin Trout last Saturday night to get his voluntary defense out of the way, and he’ll now be fighting IBF/WBA 154lb champion Jarrett Hurd (22-0, 15 KOs) next. Richard Schaefer reportedly announced at the post-fight press conference last Saturday that adviser Al Haymon will be working on making the Hurd-Charlo fight for a unification fight between them. Charlo talks a lot of trash, but I’m not sure he’s ready for the kind of fire power that Hurd will be bringing to him. If you take away the two knockdowns that Charlo scored last night against Trout, he would have lost the fight. The fight was closer than it should have been, and the reason for that is Charlo isn’t the full package. He still has a lot of flaws. Hurd is going to put Charlo under a lot of heat for as long as it lasts, without letting him take breaks the way he was last Saturday. Hurd is going to walk Charlo down, and either knock him out or force him to run for 12 rounds. The boxing fans at ringside were booing Charlo like mad in the final round when he ran from Trout in the championship rounds. If Charlo fights like that against Hurd, he’s going to be booed out of the arena. Hurd will very likely be the favorite against Charlo, because he’s bigger, stronger and has the better chin of the two. Before beating Tony Harrison in February 2017, Hurd wasn’t viewed as a future star in the 154lb weight class. Hurd wore Harrison down and stopped him in the 9th round. Hurd then went from there and defeating Austin Trout by a 10th round stoppage last year, and then most recently he beat WBA Super World junior middleweight champion Erislandy Lara by a 12 round split decision last April to become a unified champion. Suddenly, Hurd is now seen as the best fighter in the 154lb weight class by a lot of boxing fans, and the only guy that stands in his way is the 28-year-old Jermell. WBO champion Jaime Munguia is viewed as still too young at 21-year-old to have any chance of beating Hurd. Jermell is the only guy left that has any real chance of defeating him. If Hurd beats Jermell, as many believe he will, then Munguia will likely be the next to fall if the Mexican fighters’ management at Zanfer Promotions allow that fight to get made. Charlo (31-0, 15 KOs) had a lot of problems beating the 32-year-old Trout by a 12 round majority decision at the Staples Center in Los Angeles, California. The scores were 118-108 and 115-111 for Charlo, and 113-113. Trout not only went the full 12 rounds, but he fought well enough to deserve a draw in the eyes of a lot of people that saw the fight. Charlo failed to knockout Trout like he’d said he would. Hurd, 27, successfully stopped Austin last October in the 10th round, and in his fight before that, he beat WBA Super World junior middleweight champion Erislandy Lara by a 12 round split decision last April. It’s Charlo’s fault for letting Trout survive the full 12 rounds, because he had him hurt many times in the fight. If Charlo had put in some effort in the championship rounds, he would have likely knocked him out. round unanimous decision. Jermell was fortunate to get a 12 round majority decision last Saturday, as a lot of boxing fans felt that the fight was close enough to be scored a draw. Charlo fought well at times, but then he would ease up on Trout and let him steal rounds by not fighting hard enough. Trout is right. He would have won the fight if he hadn’t been knocked down twice in the fight in getting dropped in rounds 3 and 9. When Charlo was dialed in and letting his hands go, he was effective, but he wasn’t consistent with his offense and this enabled Trout to make it closer than it should have been. Charlo had Trout where he wanted him in the last three rounds, but he let up and coasted in rounds 11 and 12. That let Trout take the rounds. Trout will still be around as a contender/gatekeeper in the 154lb division, but as far as him winning another world title in that weight class, I don’t see it happening. If Jermell Charlo loses to Hurd, then he’s going to have to sit and wait until he vacates his title and moves up to middleweight before he can try and recapture his WBC 154lb title. Jermell’s future will depend on what takes place with Hurd. If Hurd beats Charlo, then he’s going to need to wait for him to move up in weight for him to have a future as a champion. If Hurd elects to stay at 154 for any time, Jermell will have to be satisfied with being a contender unless his manager Al Haymon can line him up with a fight against WBO belt holder Munguia. I don’t know if Charlo beats Munguia though. That guy can really punch, and he might be too powerful for him to deal with. As long as Munguia can handle Charlo’s shots, he’s got an excellent chance of stopping him if he can land the same kinds of shots that Trout was.